This was a 14-day cruise to the eastern Caribbean from New York City. The itinerary included: San Juan, Puerto Rico; St. Thomas; St. Maarten; Tortola; Martinique; Barbados and St. Kitts. I like cruising on Breakaway. She is a well-made ship with good attention to detail. She also offers a nice variety of dining and entertainment alternatives. This was my fifth cruise on the ship and as a general conclusion, I would say that she is operating at or near the best I have seen. The overall atmosphere on Norwegian Breakaway is casual. In addition, under Norwegian's Freestyle cruising, the cruise experience is less structured than on more conventional ships. There is no dress code, no assigned dining times, no assigned tables. Guests have a great amount of freedom of choice. This does not mean that guests can totally do what they want when they want. Making reservations for the main shows and for the specialty restaurants is encouraged. There are limits to the capacities of the theaters and restaurants and so if you decide to just drop by a theater or a restaurant when the mood strikes you, you might be disappointed. 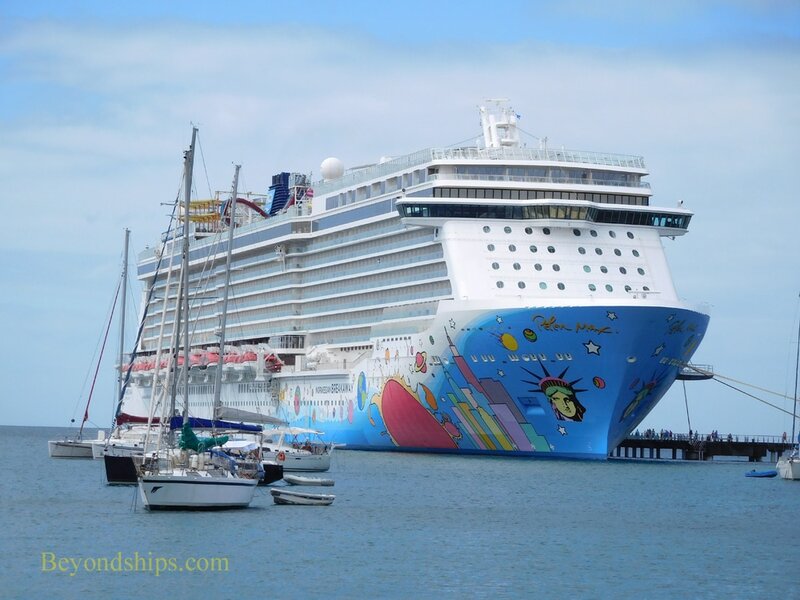 Norwegian Breakaway is a very large cruise ship carrying some 4,000 passengers. However, within the ship are a number of different constituencies. There is the luxury world of the Haven, which has its own restaurant, bar, courtyard and open decks. There is the Studios, a group of cabins designed for solo travelers, which has its own lounge and bar. Then there are the more conventional cabins (balconies, oceanviews, interiors) where the majority of the passengers stay. Thus, there is no single Breakaway cruise experience. In addition, I find that on large ships people then to gravitate towards people with similar interests. You may meet people at say a trivia quiz or at the fitness center and because of that common interest, you become friends throughout the cruise or perhaps longer. Thus, there is little danger of becoming lost in a sea of people. One very positive aspect about this cruise was that it began and ended in New York. Thus, for many of the passengers who live in the northeastern United States and eastern Canada, it did not involve flights to get to and from the ship. For those who live elsewhere, the cruise could be combined with a few days sightseeing in New York. As might be expected, most of the passengers on this cruise were from northeastern North America. However, there was also a significant international contingent with quite a few guests from the UK and Germany. Because it was a 14 day cruise while school was in session, there were few young families with children. Most passengers seemed to be in the early years of their retirement. Of course, cruising from New York in the winter necessarily involves sailing up and down the East Coast in order to get to and from the warm weather of the Caribbean. Often this is entirely uneventful but the ship can encounter winter storms and on this cruise, Breakaway met with storms both coming and going. These, however, were mild and most passengers were out and about enjoying the features of the ship. To make the trip more comfortable, the captain altered course to avoid the storm centers. He also spent considerable time during his announcements telling passengers about the weather conditions ahead of time and reassuring less experienced passengers that there was no cause for concern. This entirely dissipated the cloud of apprehension that sometimes hangs over a ship approaching storm. Although she is not an ocean liner, Breakaway is a good quality ship and handled the seas well. There was some movement but not much during the storms. ​Breakaway was designed for warm weather cruising. Not only are the upper decks open to the elements but there is a large open promenade that is used for restaurants and bars as well as for strolling. During the first and last day of the cruise, it was too cold for most people to use the pools, water slides and sports facilities. However, as the ship came parallel to Virginia, the temperatures moderated to an early Spring degree and people were going outside. To prevent crowding during the day, the ship's specialty restaurants were opened. They did not serve food but guests could sit at the tables, talk, play games or read a book. This was in addition to the various organized cruise activities (e.g. trivia quizzes, art auctions) taking place in the public areas of the ship. Disappointingly, there was no enrichment program to speak of on this cruise. With the exception of some Q&A sessions with the officers and the entertainers, the talks were to promote things being sold on the ship (e.g., spa treatments, art auctions). Until recently, the thinking of the cruise industry has been that lectures and more sophisticated entertainment for the mind are something for the more premium lines and not something that works on mass market cruises. But Carnival's innovative Carnival Journeys program (see article) is creating pressure on the other mass market lines to re-think the conventional wisdom. I was also disappointed in the internet offering. Norwegian now offers internet packages based upon megabits. This is an improvement over the old per minute charging because a slow connection does not eat up your whole package. However, the internet is evolving so that videos and video ads are prevalent on pages like Facebook and other social media. E-mails often have photo attachments in the form of logos and signatures. These eat up megabits. As a result, it is hard to gauge how many megabits you are using and many guests found that the packages that they purchased were used up quickly doing everyday things such as checking e-mails. The per day and per voyage pricing used on some of the other major cruise lines is a better approach. Food is the quintessential matter of personal taste. What I like may not be what you like. But with that disclaimer, I can say that I was pleased with the dining on Breakaway. I say this for three reasons. First, the menus in the main dining rooms had variety. There was always something interesting on the menu. Second, the quality of the food came through in the flavor. At one time, I would not have said this about the food on Norwegian but happily, the line appears to be sticking to the commitment it made in late 2015 to better quality ingredients. Third, the food had personality. To avoid upsetting anyone, cruise ship food is typically bland. So much so that I have taken to bringing my own spices along on some cruises. There was no need to do that here. Breakaway also has a good line up of specialty restaurants. I especially liked the filet minion, which is prepared slightly differently at Le Bistro, La Cucina, Moderno and Cagney's. I also heard glowing reports from several sources about the seafood at Ocean Blue although I did not eat there on this cruise. One change from last year that I did not like was the conversion of the Uptown Grill into a seagoing Margaritaville. The Uptown Grill was a premium burger venue where you could get a good quality burger cooked to order with a wide selection of toppings, There was also a salad station where a staffer would compose a salad based upon your selections from a wide array of ingredients. Since both the burgers and the salads were made exactly to each guest's specifications, no one walked away unhappy. It was complimentary and always full to capacity. The new venue carries the name of the popular shoreside Margaritavilles but little has been done to convey the atmosphere of those establishments. It has good nachos and the burgers are fine. However, they are prepared according to a set formula, not according to each guest's personal tastes. In addition, this is an extra-tariff venue. Very good nachos and excellent burgers are available at O'Sheehan's Bar and Grill downstairs for free. Not surprisingly, the new venue is not crowded. Service in all the restaurants, indeed throughout the ship, was very good. Like all cruise lines, Norwegian has set procedures. However, the crew on Breakaway seemed to realize that the overall objective is to please the guests and that mechanical application of procedures will not achieve that objective. They seemed empowered use their initiative to find ways of meeting the guest's needs within the framework set forth by the line. Of course, you occasionally meet someone who is a trainee new to cruising or someone who just does not get it but there were very few. One waiter I met at O'Sheehan's was so enthusiastic about Norwegian that he was able to recite the names of all the ships Norwegian has on order and when they will be joining the fleet as well as the deployments of the existing fleet. He seemed as well informed as the people at the Cruise Next desk. Such enthusiasm is a sign of good management both onboard and at the corporate level. Breakaway's main shows remain the same as when the ship entered service, i.e., a full production of the Broadway shows “Rock of Ages” and “Burn the Floor.” Both are very good productions. A number of visiting performers came aboard during the voyage. Of these, the most memorable was Harry O'Donoghue, who performed a charming evening of Irish comedy and singing. In addition to these shows in the main theater, Breakaway has had since its outset a dinner theater in the Spiegel Tent. “Cirque Dreams Jungle Fantasy” is a fast-paced high energy production featuring aerialists, acrobats, contortionists, magicians and dancers. It is so absorbing that you have to remember to eat the tasty meal that is presented during the show. Elsewhere in the ship, a Second City comedy troupe performed a number of shows in Headliners and Charley Love and the Silky Smooth Band played blues and Motown in Fat Cats. The in-cabin television was also good. It had several news channels, thus giving a variety of views on the news, as well as a sit-com channel and a movie channel. The content on the latter was changed during the course of the cruise and so did not become repetitious. This was particularly enjoyable late at night before going to sleep as well as during port days after returning from the islands.